Most guidelines have been proposing, for more than 15 years, a β-lactam combined with either a quinolone or a macrolide as empirical, first-line therapy of severe community acquired pneumonia (CAP) requiring ICU admission. Our goal was to evaluate the outcome of patients with severe CAP, focusing on the impact of new rather than old fluoroquinolones combined with β-lactam in the empirical antimicrobial treatments. Retrospective study of consecutive patients admitted in a 16-bed general intensive care unit (ICU), between January 1996 and January 2009, for severe (Pneumonia Severity Index > or = 4) community-acquired pneumonia due to non penicillin-resistant Streptococcus pneumoniae and treated with a β-lactam combined with a fluoroquinolone. We included 70 patients of whom 38 received a β-lactam combined with ofloxacin or ciprofloxacin and 32 combined with levofloxacin. Twenty six patients (37.1%) died in the ICU. Three independent factors associated with decreased survival in ICU were identified: septic shock on ICU admission (AOR = 10.6; 95% CI 2.87-39.3; p = 0.0004), age > 70 yrs. (AOR = 4.88; 95% CI 1.41-16.9; p = 0.01) and initial treatment with a β-lactam combined with ofloxacin or ciprofloxacin (AOR = 4.1; 95% CI 1.13-15.13; p = 0.03). Our results suggest that, when combined to a β-lactam, levofloxacin is associated with lower mortality than ofloxacin or ciprofloxacin in severe pneumococcal community-acquired pneumonia. Streptococcus pneumoniae is the leading causative agent of community-acquired pneumonia (CAP). Despite new antimicrobial agents and advances in supportive measures, attributable mortality linked to pneumococcal pneumonia remains unchanged and dramatically high when patient are admitted in intensive care units (ICU) . Most guidelines have been proposing, for more than 15 years, a combination of a β-lactam with either a quinolone or a macrolide as empirical, first-line therapy of severe CAP requiring ICU admission [2–8]. Although a recent study demonstrated combination antibiotic therapy to be associated with a higher survival rate than monotherapy in patients with severe CAP and shock , the rationale for this combination was not to increase efficacy but rather to routinely provide coverage of all common pathogens causing severe CAP and particularly, S. pneumoniae and Legionella species. In our ICU, we followed until 2003 the 1991 French recommendations . Most patients received an empirical therapy based on a β-lactam-fluoroquinolone combination. Before 2003, fluoroquinolones used were ofloxacin and ciprofloxacin. Levofloxacin replaced these quinolones since its 2003 addition to the hospital formulary. Such a replacement was comforted by the ERS, French and IDSA guidelines published between 2005 and 2007 [6–8]. We wished to determine outcomes of patients treated with a combination of β-lactam plus fluoroquinolone for severe pneumococcal pneumonia. This homogenous modification of severe CAP antibiotic management in our ICU gives us the further opportunity to assess the influence of a fluoroquinolone with enhanced activity against S.pneumoniae. Firstly, we retrospectively collected all consecutive patients aged > 18 years who were admitted into our ICU (16-bed medical and surgical intensive care unit in a 450-bed general hospital) between January 1996 and January 2009 for severe community-acquired pneumonia (CAP) and who received a definite diagnosis of pneumococcal pneumonia. Secondly, we selected patients who received, as initial antibiotic treatment, a β-lactam plus a fluoroquinolone, used with an appropriate dosage by IV route. Thirdly, patients were divided into two groups according to the fluoroquinolone used, Group A for ofloxacin or ciprofloxacin, Group B for levofloxacin. The study protocol was submitted to the Institutional Review Board for University Hospital of Lille which gave an approval with waiver of informed consent, in agreement with French regulations concerning such retrospective studies. CAP was defined by the following criteria observed at initial presentation or occurring within 48 h following hospitalization: acute onset of signs and symptoms of lower respiratory tract infection and a new pulmonary infiltrate found on the hospital admission chest radiograph. We excluded patients coming from nursing homes or hospitalized within 90 days prior to developing pneumonia or hospitalized > 48 h in general medical wards before ICU admission, and those with radiographic abnormalities attributed solely to any other known cause (i.e., pulmonary embolus, lung carcinoma or congestive heart failure). The decision for admission to our ICU was made, in all cases, by the attending physicians. However, only patients having a Pneumonia Severity Index (PSI) score ≥ 4 were included in this study . Streptococcus pneumoniae was considered as the causative agent of CAP when a S. pneumoniae strain was isolated from > 1 blood culture or when validated sputum (< 10 squamous epithelial cells and > 25 polymorphonuclear cells per low-power field) or tracheobronchial aspirates cultures grew with > 105 cfu/mL S. pneumoniae. Patients having CAP due to a penicillin-resistant strain of S. pneumoniae (MIC > 2 mg/l) were excluded from our study. Appropriate drug dosages were defined in the French recommendations as: amoxicillin > 50 mg/kg/d, cefotaxime > 50 mg/kg/d, ceftriaxone > 20 mg/kg/d, piperacillin > 200 mg/kg/d, ofloxacin = 200 mg/12 h, ciprofloxacin = 400 mg/12 h, levofloxacin = 500 mg/12 h [2, 3, 7]. These drug dosages for β-lactams, ofloxacin and ciprofloxacin were unchanged during the study period. Thus, doses used in both groups were similar. Within 24 h of admission, all patients underwent clinical, radiological and biological tests. Briefly, we recorded age, gender, underlying clinical characteristics and initial vital signs. Chronic respiratory insufficiency was assessed combining the usual clinical and radiological criteria and the coexistence of ventilatory impairment assessed either before or after ICU stay. Immunosuppression was defined as recent use of immunosuppressant or systemic corticosteroids (i.e., prednisolone > 0.5 mg/kg/day for more than 1 month), human immunodeficiency virus infection, neutropenia (absolute neutrophil count < 1.000 cells/mm3), organ transplantation with ongoing immunosuppressant, cancer chemotherapy within the past 3 months, or asplenia. Shock was defined as a sustained (> 1 h) decrease in the systolic blood pressure of at least 40 mm Hg from baseline or a resultant systolic blood pressure < 90 mm Hg after adequate volume replacement and in the absence of any antihypertensive drug . Severity of illness at admission to ICU was assessed using the Simplified Acute Physiology Score II (SAPS) II , the Sepsis-related Organ Failure Assessment (SOFA) score  and the logistic organ dysfunction (LOD) score . We also calculated the PSI at ICU admission . For all patients, information on the following therapeutic topics instituted within 48 hours following ICU admission was recorded: supportive measures such as mechanical ventilation or hemodialysis, use of vasopressor drugs, hydrocortisone, drotrecogin alfa (activated), or intensive insulin therapy. The effectiveness of initial antimicrobial therapy was assessed within 72 h after treatment as follows: A lack of clinical improvement 3 days after treatment initiation (worsening or persistent fever or hypothermia, worsening of pulmonary infiltrates or of respiratory function assessed by PaO2/FiO2) defined an ineffective treatment. On day 3, day 5 and day 7, body temperature, and SOFA score were determined. During the patient's stay in the ICU, occurrence of complications was recorded. We distinguished sepsis-related complications (secondary septic shock, acute respiratory distress syndrome or development of multiple organ failure), hospital-acquired lower respiratory tract (HA-LRT) superinfections and ICU-related complications (i.e., upper gastrointestinal bleeding, catheter-related infection, deep venous thrombosis and pulmonary embolism). Multiple organ failure (MOF), acute respiratory distress syndrome (ARDS) and HA-LRT were defined according to usual criteria [15–17]. Durations of mechanical ventilation, treatment with vasopressor drugs, and ICU length of stay were noted. Finally, patient mortality was evaluated on D-15, and at the time of ICU discharge. Descriptive analyses were performed in order to check and resume data. Characteristics of patients in each group were compared. Continuous variables were compared using the Student's t test. Categorical variables were compared using Chi-square test or Fisher's exact test when Chi-square was not appropriate. Differences between groups were considered to be significant for variables yielding a p value < 0.05. A stepwise logistic regression including variables collected within the first 48 hours of ICU stay and associated with a p value < 0.15 in bivariate analysis was performed. Adjusted odd-ratios were computed using a logistic regression analysis including the independent predictors of mortality. The Kaplan-Meier product limit method and the log-rank test were used to construct and compare survival curves for patients in each group. During the study period, 378 patients with severe CAP were admitted in our unit. Among them, 83 (22%) patients exhibited a severe pneumococcal pneumonia and, finally, we identified 70 patients treated with a β-lactam combined with a fluoroquinolone, including 53 men (75.7%) and 17 women (24.3%). The mean age was 63.8 ± 16.8 years. S. pneumoniae was identified in blood cultures in 25 patients (35.7%). Infection was polymicrobial in 18 patients (25.7%). Causative pathogens associated with S. pneumoniae were Haemophilus influenzae (n = 7), methicillin susceptible Staphylococcus aureus (n = 4), enterobacteriaceae (n = 4), Streptococcus spp. (n = 2) and Moraxella catarrhalis (n = 2). All pathogens were susceptible to at least one drug (β-lactam and/or fluoroquinolone) received by the patients. Thirty-eight patients (54.3%) were classified as Group A. β-lactams used were a third generation cephalosporin (n = 20; 52.6%), amoxicillin ± clavulanic acid (n = 16; 42.1%) and piperacillin-tazobactam (n = 2; 5.3%) combined with ofloxacin (n = 33; 86.8%) or ciprofloxacin (n = 5; 13.2%). Thirty-two patients (45.7%) were classified as Group B. β-lactams used were a third generation cephalosporin (n = 26; 81.3%), amoxicillin ± clavulanic acid (n = 5; 15.6%) and piperacillin-tazobactam (n = 1; 3.1%) combined with levofloxacin. Main patients' characteristics on ICU admission are reported Table 1. Most characteristics were similar in the two groups. However, underlying chronic respiratory insufficiency and bacteremia were more frequent in Group B patients. MV: mechanical ventilation; SAPS: simplified acute physiology score; LOD score: logistic organ dysfunction score: SOFA: Sepsis-related Organ Failure Assessment score; PSI: Pneumonia Severity Index; ARF: Acute Respiratory Failure. Main therapeutics instituted during ICU stay, evolution of severity scores, and occurrence of complications are reported Table 2. The most significant differences between the two groups of patients were the more frequent use of drotrecogin alpha, intensive insulin therapy and hydrocortisone in Group B patients. MV: mechanical ventilation; SAPS: simplified acute physiology score; LOD score: logistic organ dysfunction score: SOFA: Sepsis-related Organ Failure Assessment score; PSI: Pneumonia Severity Index; HA-LRT superinfections: hospital-acquired lower respiratory tract superinfections; LOS = length of stay. On Day 15, 14 (20%) patients had died, 12 (31.6%) in Group A and 2 (6.3%) in Group B (p = 0.02). Overall, 26 patients died in the ICU, 17 (44.8%) in group A vs. 9 (28.1%) in group B (p = 0.15). So, difference in mortality rates was only significant during the first 15 days of ICU stay (Figure 1). In Group A, in-ICU mortality was 45% (9/20) when ofloxacin or ciprofloxacin were combined with a third generation cephalosporin and 44.4% (8/18) when combined with another beta-lactam, respectively (p = 0.97). In group B, it was 26.9% (7/26) when levofloxacin was combined with a third generation cephalosporin and 33.3% (2/6) when combined with another beta-lactam (p = 1). Results of ICU-discharge survival prognosis bivariate analysis, including factors present on ICU admission, are reported Table 3. All underlying diseases (excepted chronic heart failure), mechanical ventilation, use of a third generation cephalosporin combined with a fluoroquinolone, and bacteraemia on ICU admission did not appear as significant prognostic variables in this analysis. Among the 25 bacteremic patients, mortality was higher in group A patients (66.6%) than group B patients (31.3%), but the difference was not statistically significant (6/9 vs. 5/16; p = 0.11). Among the 34 patients with septic shock on ICU admission, mortality was higher in group A patients (71%) than in Group B patients (47%), but the difference was not statistically significant (8/17 vs. 12/17; p = 0.30). MV: mechanical ventilation; SAPS: simplified acute physiology score; LOD score: logistic organ dysfunction score: SOFA: Sepsis-related Organ Failure Assessment score; PSI: Pneumonia Severity Index. Among variables collected during the ICU stay, use of hydrocortisone, intensive insulin therapy, haemodialysis and occurrence of HA-LRT superinfections did not appear as significant prognostic variables. Conversely, improvement on D3, SOFA > 8 on D3, D5, and D7, and occurrence of sepsis-related complications were significantly associated with outcome at ICU discharge (Table 4). SOFA: Sepsis-related Organ Failure Assessment score; HA-LRT superinfections: hospital-acquired lower respiratory tract superinfections. According to the results of the bivariate analysis, the following variables were entered in the stepwise analysis: chronic heart failure, age > 70 yrs, acute respiratory failure requiring mechanical ventilation, septic shock on ICU admission, use of hydrocortisone, haemodialysis, PSI score = 5, SAPS II > 50 on D1, LOD > 8 on D1, SOFA >8 on D1 and initial treatment with a β-lactam combined with ofloxacin or ciprofloxacin (Group A). Three independent factors associated with outcome at ICU discharge were identified: septic shock on ICU admission (AOR = 10.6; 95% CI 2.87- 39.3; p = 0.0004), age > 70 yrs. (AOR = 4.88; 95% CI 1.41-16.9; p = 0.01) and initial treatment with a β-lactam combined with ofloxacin or ciprofloxacin (AOR = 4.1; 95% CI 1.13-15.13; p = 0.03). 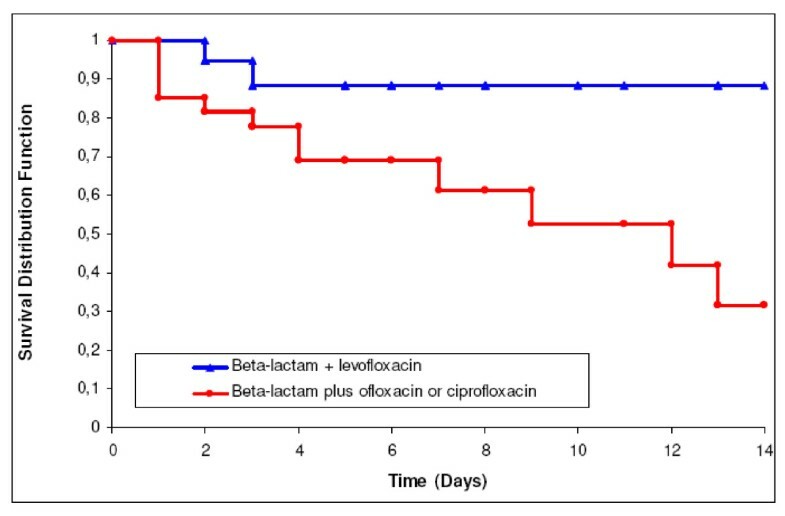 The main finding of this retrospective analysis is that levofloxacin plus a β-lactam appears to be associated with improved survival compared to ofloxacin or ciprofloxacin plus a β-lactam in severe pneumococcal CAP. Empirical antibiotic regimen for ICU-treated severe CAP has long been recommended to cover the 3 most common severe CAP pathogens (S. pneumoniae, S. aureus and H.influenzae), atypical pathogens and most relevant Enterobacteriaceae species. Levofloxacin is a fluoroquinolone active against most of these pathogens, especially S. pneumoniae with or without decreased penicillin susceptibility [18, 19]. Its clinical activity in CAP has been well documented in various clinical trials in Europe and the USA [20, 21]. Some studies demonstrated the efficacy of levofloxacin used as monotherapy in severe CAP, compared to ceftriaxone plus erythromycin or cefotaxime plus ofloxacin [22, 23]. Nevertheless, experts continue to propose, for ICU-treated severe CAP, an empirical antibiotic regimen based on an anti pneumococcal β-lactam combined with either a macrolide or a fluoroquinolone. Since respiratory fluoroquinolones with enhanced activity against S. pneumoniae (levofloxacin, moxifloxacin or gemifloxacin) became available, they replaced second generation fluoroquinolones (ofloxacin or ciprofloxacin) in the guidelines [6–8]. This fluoroquinolone generation shift has never been clearly justified and, to our knowledge, no clinical study has compared these different quinolones combined with a β-lactam in severe CAP. Our results suggest that, when severe CAP causative agent is S. pneumoniae, a combination levofloxacin plus β-lactam is associated with lower mortality than a combination ofloxacin or ciprofloxacin plus β-lactam. These results could be surprising as all patients received an appropriately dosed β-lactam active against S. pneumoniae and as numerous strains of S. pneumoniae remain in vitro susceptible to ofloxacin or ciprofloxacin. However, there might be bacteriological and clinical data explaining our results. A synergy between β-lactams and levofloxacin against S. pneumoniae has been reported . Conversely, synergy was rarely observed between the combination of cefotaxime and ofloxacin . Recent clinical studies suggest that combination therapies could improve the prognosis of pneumococcal pneumonia: Waterer et al. retrospectively studying 225 patients with severe bacteremic pneumococcal pneumonia demonstrated that a single effective therapy was an independent predictor of mortality (AOR = 6.2) . Baddour et al. performed a prospective, multicenter, international study including 844 adult patients with S. pneumoniae bacteremia . Although the 14-day mortality was not significantly different for all patients receiving monotherapy versus combination (11.5% vs. 10.4%), a combination of in vitro active agents was associated with a significantly lower mortality than a single active agent (19.4% vs. 60%; p = 0.0006). The present work has numerous limits. The most important is probably major treatment differences among the two groups. Patients were recruited during a long period (1996-2009), during which therapies such as hydrocortisone, drotrecogin alfa (activated), or intensive insulin therapy were introduced. Management of septic shock and ARDS has changed following results of large international studies [28, 29]. As most changes in management of patients with multiple organ failures overlap with our antibiotic policy changes, our results might be biased. Indeed, hydrocortisone use and intensive insulin therapy were more frequent in group B than in Group A. However, these factors were not significantly associated with ICU survival in bivariate analysis and hydrocortisone use, in multivariate analysis, was not an independent prognostic factor.. Moreover, there is no evidence suggesting a survival benefit by most adjunctive therapies in patients with CAP  and the benefit of intensive insulin therapy in medical ICU and/or low-dose steroids is now highly questionable [31, 32]. Similarly, the use of cephalosporin is more frequent in group B than in group A. However, the use of a third generation cephalosporin rather than amoxicillin has no impact on prognosis. This is not surprising as, to our knowledge, no clinical study demonstrated a third generation cephalosporin to be superior to amoxicillin for non penicillin-resistant S. pneumoniae CAP as far as drug dosage is adequate. Finally, some important prognostic parameters such as the time elapsed between admission and the first dose of antibiotic were not taken into account in our study. Before 2006, we did not have computerized data charts thus, exact time of admission and antibiotics admission, particularly for patients transferred from other departments/hospitals cannot be obtained. Our study suggests that levofloxacin combined with a β-lactam is associated with improved survival in comparison with ofloxacin or ciprofloxacin combined with a β-lactam in severe pneumococcal patients admitted in the ICU. This combination, proposed by current guidelines as empirical treatment of severe CAP patients admitted in ICU could improve their prognosis. Obviously, only a prospective, randomized, double-blind trial could confirm this result. DO collected data and helped to draft the manuscript., HG participated in the design of the study, collected data and helped to draft the manuscript, PD performed the statistical analysis., NB collected data and helped to draft the manuscript, AC collected data and helped to draft the manuscript, AM collected data and helped to draft the manuscript, SA collected data and helped to draft the manuscript, and OL contributed to the design of the study and wrote the manuscript. All authors read and approved the final manuscript.